The highlighted section in blue are taken from original hand written letters by Tom Hunter. Lines in Italic are taken directly from a typed report on the progress of the group. 'Consideration concerning walkers and routes'. It was felt that these long distance routes should be neither for the casual walker in soft shoes or high heels nor the Hillman who prided himself on his ability to cross any terrain in any weather they should be for the person capable of energetic walking and wanted mild adventure in lonely places and who could use a compass and carry his requirements in his rucksack possibly including a tent. It was also felt that these routes should avoid traffic roads , pass beside or close to places where overnight accommodation could be had such as hotels , houses , hostels and camp sites and also shops and telephone kiosks. This self-reliance and outdoor spirit of adventure and endeavor would be an explanation for the attitude towards signposting of the Way, and 'should be kept to a minimum and should only be used at villages and main roads where the path is not obvious...’. 'It is presumed that in time the long distance routes will have published directions available to the public...' how right they were! The West Highland Way opened in 1980 and is one of Scotlands most popular outdoor attractions with over 85,000 people walking along its various parts each year and 30,000 doing the entire route. The route , normally done south from Milngavie just north west of Glasgow to Fort William in the north , at current total of 96 miles or 154 Kms , is an established and popular long distance route with walkers from all over the world. But how did we arrive at the current WHW as we recognise it today? The answer is that it has its roots firmly established in within the committee of Glasgow HF Outdoor Club in 1969. In his report on the 'Long Distance Pedestrian Way' , Tom Hunter of The Glasgow Group of The Holiday Fellowship states that The original idea was the 'brain child' of Alex Gray an Honorary President of The Glasgow Group of the Holiday Fellowship, seeking the advice from other walking clubs in Glasgow he sent out a request for help and the response was generous and so The Long Distance Route Committee held their first meeting on March 4th 1969. The remit was the 'creation of public paths and long distance routes for walkers linking the towns and villages of Renfrewshire , Lanarkshire Dunbartonshire and Stirlingshire with the countryside within and outwith these counties' … 'the extent of the remit was enormous and our subcommittee of willing workers was very small so therefore on Alex Grays suggestion I wrote to several other clubs in Glasgow and asked for assistance the response was very good and after a meeting with HF Club members we rejected our wide remit and agreed to concentrate our energies on first of all our idea of a Long Distance Walking Route from the heart of Glasgow to Fort William'. The groups first task was to survey the area to be covered by the new (as yet un named) route , other walking clubs from the local areas along the way would prove to be of invaluable assistance. 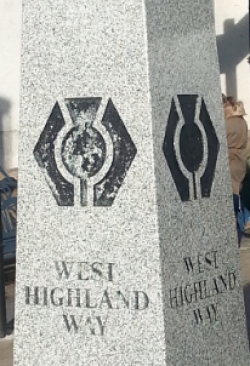 In an early discussion the group suggested that if the LDR were to continue to Mallaig the path could be named 'The Way to the Isles' , as yet Fort William remains the routes final destination. It was decided the best way to tackle this was to send out groups of walkers divided into field parties from the report group and allocated sections of the proposed path to survey , this manual process of actually walking the way , measuring time and distance , establishing the actual route as obviously none existed before , linking up existing short rights of way paths. The various survey teams completed their efforts in summer and autumn of 1969 and concluded that the maps best used for exploration of this new route were the OS 1" to the mile maps namely sheets 46,47,53,54, and 60 . 'Who did this report envisage would use the this new route , Tom Hunter wrote 'The length of the complete route is ‘slightly more than’ approximately’ …’just over’ 100 miles and as certain stretches are over rough country it is intended for the for experienced hillwalkers who can use maps and compass and who were prepared to carry full packs . It is hoped that different types of Long Distance Hillwalkers will use the route eg the people who would like to camp en route and those that prefer putting up at hotels and cottages for bed and breakfasts and those that prefer hosteling will observe that a chain of hostels are ‘in close proximity’ / near the route. To strengthen their case for support of the LDR WHW , *The Glasgow Herald on Friday September 21 1970 reported that at the opening of the Kelvin Way in Glasgow on Sept 20 1970 five men ,all members of Glasgow HF and just 1 year after their field study surveys arrived in Glasgow having walked the 104 miles from Ft William along the proposed route brought with them greetings from the Provost of Fort William to The Lord Provost of Glasgow , the message expressed hope that one day a walkway would extend from Glasgow to Fort William , Councilor Hutcheson confirmed that the Scottish Development Dept. were considering whether a long distance walkway should be established, and it was! From its conception in 1969 , the approval of the planned route in 1974 and its eventual opening on October 6th 1980 it has possibly proved more popular than ever imagined. Perhaps too popular in some peoples view so much so that the Lomond and Trossachs National park has placed restrictions on camping and the lighting of fires on the east banks of Loch Lomond. The now familiar granite obelisk in Milngavies’ main shopping area was unveiled on 20th November 1992 after it was donated by East Dun Dist Council , added to that in 2001 Marks and Spencers added 2 decorative benches and an arch through which walkers past on the start (or end ) of their journey. Despite the West Highland West being developed with only the walker in mind little did Tom Hunter and his group realise the popularity that mountain biking would play in the enjoyment of this LDR , many bikers have made the traverse either in whole or in parts some even in one day ! As impressive as this may be what was probably also not envisaged was the growth/ popularity of Trail Running and Ultra Marathon running , there are 3 organised and well established races that take place along the way , The 53 miles(85k) of the Milngavie to Tyndrum section starts at 1am in Milngavie , The Devil O' the Highlands starts off where the Mingavie to Tyndrum finishes (not on the same day) , this race takes in the route from Tyndrum to Fort William all 43 miles(69k) of it and that includes the 1,800 ft of ascent of the Devils Staircase from Glencoe and thankfully its downhill run into Kinlochleven and onto Fort William. However these 2 pale into insignificant when the WHW race proper is taken into account which is the entire 96 mile (153k), started in 1991 the record for completing the journey in one continous run was 17hrs and 48 mins , however in 2010 the record stood at , and still does , 14hrs 20m , that's an average of 7 miles per hour for 14 hrs!